A peculiar family, which owns a nougat factory, decides to set out on a trip to Madrid in order to advertise its products in a Food Fair. Besides the disapproval from the family head and company founder, events are not as expected. Ana is a doctor that works at a clinic for STDs, meeting characters from all walks of life, while outrageous situations ensue. Here Berlanga realizes another provoking film full of sourness and deep critical . Spanish coral film dealing with a merciless denounce to hypocrite society located at a luxury mansion and full of a high level of ingenious humor , including relentless critical but in malevolent intention . Spain , early the eighties in Spain , there appears a peculiar entrepreneur family ¨Planchadell and Calabuig¨, which owns a nougat Factory . The ¨Turron¨ makers family decides to advertise their products and they decide to set out on a trip to Madrid in order to publicize it in a Food Fair to convince some powerful people and Spanish princesses to buy their products . The family is formed by the widow Cuqui (Rosa Maria Sardá) , her brothers (Agustin Gonzalez , Pedro Ruiz) and cousin (Andrés Pajares) . As they move from Xixona (Alicante) to Madrid . Besides the disapproval from the family head , Don Fernando (Fernando Fernán Gómez) and company founder . But Don Fernando is only interested in an elderly Opera Singer (Maria Luisa Ponte) . Then , events are not as expected and things go wrong . The gastronomic fair is full of strange roles and Cuqui and her advertising adviser , Jacinto López (José Luis López Vazquez) , have to do everything to get his aims , but it results to be a disaster . In the flick there are especially busy comedy , ironical humor , frantic pace , joy , amusing gags , rowdy satire , noisy hustle and social critical . Furthermore , it contains certain confusion , bustle and relies heavily in exaggerated mayhem ; being in anyway clearly an inferior Berlanga film . A coral picture , but this time the formula doesn't work as well as precedent pictures . This is 10th and last collaboration between Azcona and Berlanga along 20 years , and it is their final and worst job through a long and fruitful career . The movie doesn't displays a clear structure , lacks dramatic developing and story hasn't enough interest . Shot in long , complex shots : ¨Planos Secuencia¨, with a lot of rare characters talking , shouting and walking . The main and support actors stand out under perfect direction of Berlanga very far from the tenderness that carried out in previous works , including a bitter , pessimistic mirror on the Spanish society by that time . It turned out to be a nice picture plenty of diverting situations as well as black humor and social hypocrisy . We can find very fun roles , all of them caricatures and mirrors of the Spanish society of the 80s , concerning the national reality in ironical and critical style . 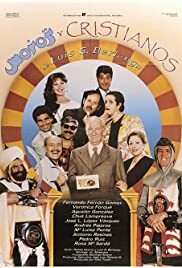 The movie displays a Spanish star-studded such as : Agustin Gonzalez , Chus Lampreave (Almodovar's ordinary) , José Luis Coll , Emilio Laguna , Diana Peñalver , and Luis Ciges . It belongs to the third period in Berlanga career characterized by commercial and comical films , adding a point of view as critical as realist . Direction by Luis Garcia Berlanga is passable , he shows his skill for edition , realizing long shots with crowd who moves easily and shows the miseries of an amoral society . Berlanga filmed several polemic movies during the 50s , all of them were beset by difficulties with the censors caused by real critical to social stratum such as ¨Bienvenido Mister Marshall¨ (1953) , a very good film which tended not to be very well received by the censor for its acidity and considered to be one of the best Spanish films of the history , including a strong portrait of Spanish society and plenty of sharpness . But the main problem is that if you are foreigner you will have to know well the Spanish society to understand the double-senses . His next joint venture was ¨Los Jueves, Milagro¨ (1957), it was modified by the censors and delayed for several years before its eventual release . Subsequently , Berlanga made ¨Placido¨ (1961) masterfully played by Cassen , this is the film debut for the great producer Alfredo Matas and received an Oscar nomination in 1963 , being well-received at the International Festivals , reviewing the useless charity , it's a sublime film but with censorship realized by this great maestro Luis Garcia Berlanga . Later on , Berlanga made one of his best films: ¨El Verdugo¨ (1963), one of the undisputed masterpieces and fundamental in filmography of Luis Garcia Berlanga and shot at the height of his creativity, in a period cultural difficult, where the enormous censorship of the political regime, exacerbated the ingenuity and imagination of the scriptwriters . He continued filming other interesting pictures as in 1973 he went to Paris to begin filming ¨Grandeur nature¨ with Michael Piccoli , another problematic film , focusing this time on the fetishism of a man who falls in love with a doll . After Francoist dictatorship , Berlanga along with his regular screenwriter Azcona carry out the realization a known trilogy about the political and social Spanish situation , concerning on the peculiar aristocratic family of the Marquis of Leguinechehe filmed a trilogy comprising ¨La Escopeta Nacional¨ (1978), ¨Patrimonio Nacional¨ (1981) and ¨Nacional III¨ (1982), where he clarified the evident disorders in the Spanish upper , middle-class upon being confronted with a new political status quo , realizing a sour denounce of the Spanish society . Berlanga shot a peculiar film titled ¨La Vaquilla¨ (1985) plenty of Spanish-star-cast and set in the Spanish Civil War , resulting to be the first time dealing with this convulsive period in comedy style . Following the same themes, he went on filming coral films as ¨Todos a Carcel¨ (1993) that won three Goya Awards for Best Film, Best Director and Best Sound ; being his final film : ¨Paris Tombuctu¨. Rating : 6/10 . Essential and indispensable watching for Berlanga aficionados . .